Featured at the back page of the Aug/Sep 2007 copy of Home and Entertaining magazine is the My Favourite Building feature. 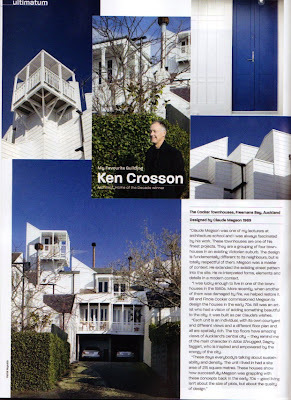 Seleting his favourite this month is architect Ken Crosson--winner in 2005 of Home and Entertaining's Home of the Decade award for his distinctive Coromandel bach --and he's chosen Claude Megson's Cocker Townhouses in Wood St, Freemans bay, Auckland, designed in 1969 and competed in 1973. Click on the pic to enlarge, or here to see a PDF of the page [5.5MB]. “Claude Megson was one of my lecturers at architecture school and I was always fascinated by his work. These townhouses are one of his finest projects. They are a grouping of four town houses in an existing Victorian suburb. The design is fundamentally different to its neighbours, but is totally respectful of them. Megson was a master of context. He extended the existing street pattern into the site. He re-interpreted forms, elements and details in a modern context. “I was lucky enough to live in one of the town houses in the 1980s. More recently when another of them was damaged by fire, we helped restore It. Bill and Finola Cocker commissioned Megson to design the houses in the early 70s. Bill was an artist who had a vision of adding something beautiful to the city. It was built as per Claude’s wishes. “Each unit is an individual, with its own courtyard and different views and a different floor plan and all are spatially rich. The top floors have amazing views of Auckland’s central city — they remind me of the main character in Atlas Shrugged, Dagny Taggart, who is inspired and empowered by the energy of the city. I love that pointer to Atlas Shrugged. Claude Megson was my hero at Architecture School and just as Bill Cocker was the Architect's Patron in several respects, so will was Bill Cocker to me, as I return from a walk through the Christchurch Botanical gardens and the sight of the autumnal Gingko leaves triggers a wave of gratitude to Bill Cocker for all he did for me. As a student and later as an Architect I lived in the 'Cocker Shack' as it was termed beside the Orakei Basin. It provided an experience and platform for the experiences that followed, and to Bill I owe an especial debt of gratitude and to Claude of course for his genius and his problematic personality. The Freemans Bay townhouses of course do not date in style, and most of Claude's work was universal because it touched a high level of Fine Art which it was my extreme privilege to share with Claude and his wife of the time working with him at Kohimarama Beach and at St Heliers near to where my family home was located. It was Claude who introduced me to astonishing symphonic music and in particular Mahler the tortured souls with whom Claude had a premonition resonance. My own daughter Melissa went on to become a classical soloist in Sydney and I am sure she was also inspired indirectly. There is so much to tell about the adventures around and within the Cocker Shack and that time in New Zealand's artistic growth. Bless Claude. Bless Bill and Finola. Thank you. Thanks for your comment, and your stories. Yes, he was one of my heroes too -- he made the place bearable. I'd love to hear more about those adventures around and within the Cocker Shack ... ?